Try this activity which has two possible Task 1 essays (a process and a graph). Look at the columns “Sep-10 to Aug-11” (third column) and “Sep-09 to Aug 10.” Export the main part of the table into Excel, delete all the other columns except the third and last ones, and sort to find the top ten or twelve exporters. What is the unit of measurement – is it kilos? tonnes? tons? bags? Who were the top two exporters? How much did they export? What is the next group of countries? What is the last group of countries? Which countries produced less in 2011? What happened in most countries between 2010 and 2011? By answering the questions above, you should now know the main trends and the most important information in the graph. Exports from Indonesia fell slightly. Indonesian exports fell from 8 million bags to just over 7 million. In 2011, Indonesia exported less than 8 million bags. Have a mix of sentences without numbers and sentences with numbers, or data. Vietnam was the second largest producer. It exported over 17 million bags in 2011, up from 14 million in the previous year. Output in the Ivory Coast (Cote d’Ivoire) fell by half, from 2 million to just 1 million bags. This made it the only major producer with a drop in exports. Make sure your 150 words has the main idea. You should generally be able to identify TWO trends or main ideas in a graph in IELTS. Overall, Brazil and Vietnam are by far the biggest exporters, but almost all the top twelve producers countries increased output in 2011. The graph shows coffee exports for the top 12 countries in the world in 2010 and 2011. Overall, the biggest producers by far are Brazil and Vietnam, and there has not been much change in the ranking of the top producers in the last two years. 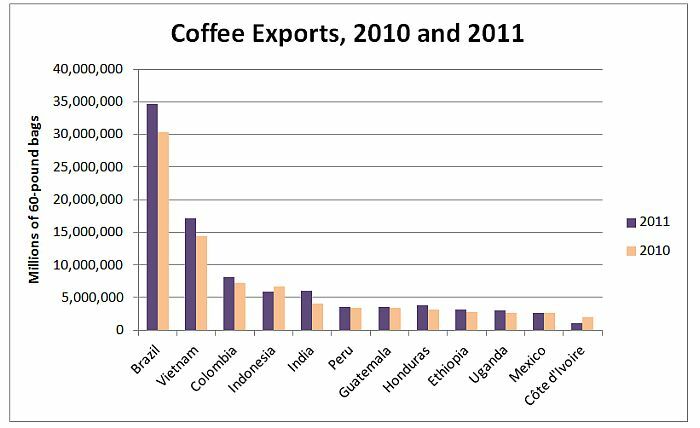 Almost every country in the graph produced more coffee in 2011 than in 2010. Brazil was the largest producer. It increased exports from 30,000,000 bags in 2010 to almost 35,000,000 in 2011. 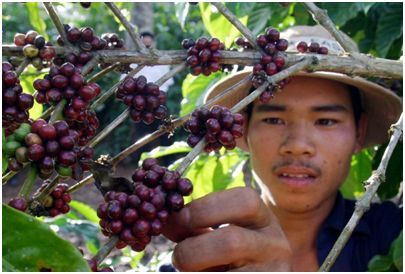 Vietnam was the second largest producer, and it also increased its output from under 14,000,000 bags to about 17,000,000. Colombia, Indonesia and India exported almost the same amount, at between 6 and 8 million bags, and then a large group of countries including Peru, Guatemala, Honduras, Ethipia, Uganda and Mexico produced about 3 or 4 million bags in both years. Only two countries in the graph exported less in 2011. They were Indonesia and Cote d’Ivoire. In Cote d’Ivoire, production fell by 50%, from 2 million bags to 1 million. Here’s a PDF with a suggested answer and graph. The Production Trail of Coffee from Tim Whalen on Vimeo. Listen to the video animation at http://vimeo.com/6585436. Make notes. The video uses a mix of active and passive sentences. Don’t write everything – put it in your own words. You should easily be able to write a 150-word description of how coffee is processed. If you need more information, read this HowStuffWorks page, or this one from www.hawaiianmoonbeanscoffee.com. Coffee is grown in the tropics, the hot, wet areas north and south of the equator. The coffee beans come from coffee cherries, which have a thick skin and a pulp and other layers around the beans. There are two ways to remove the skin: the wet method and the dry method. In the wet method, machines and water are used to remove the skin. In the dry method, the beans are dried and the hot sun makes it easy to remove the skin. In both methods, the beans are fermented in tanks and then dried again. The outer layers are removed and the beans are sorted. Next the beans have to be roasted for flavour. The beans turn dark gold color and begin to smell like coffee. The beans are roasted for about 8 minutes until they pop and become bigger. When they pop a second time they are fully roasted. Very dark coffees are roasted for longer. The coffee is now ready to be ground and consumed.